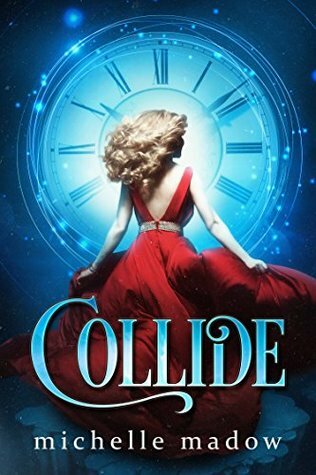 Collide follows Anna after she is shot at a high school dance and transported to a parallel universe where her mother is still alive. The catch is that she is transported to a week before the dance and she will do anything to stop the shotting from happening. I liked the idea and plot of this book. It was a cross between Before I Fall and the movie Groundhogs Day. It was fast-paced and I never felt like there were scenes that could have been omitted. I think this is a strength in Madow's writing. I always want to read more, even when the story itself is only mildly interesting, which was the case with Collide. The reason the story was only mildly interesting for me was because the characters acted incredibly immature. Anna was so caught up in her own relationship drama that at times I don't think she was even thinking about the dance or how to stop the shooting. She was more interested in trashing her former friends' relationship, and getting her boyfriend back, than spending time with her mother. It just wasn't believable to me. Overall, this was a decent read. It was easy to get through, fast-paced, and had an intriguing plot. There were certain aspects of the story that I found grating but at the end of the day this was a fun, easy read, and sometimes you just need one of those.